Your tires are one of the most important elements of your bike–they’re what connect you to the ground. It’s important that they be durable, grip well, and help you move along quickly. Whether you’re building up your bike for the first time or just need a new pair, this guide will help you figure out what you should be looking for when you pick out a tire. 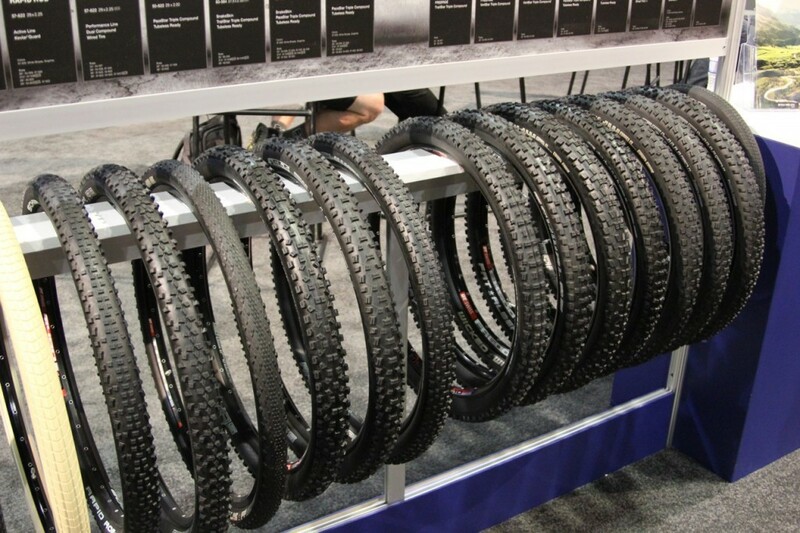 Bicycle tires come in a variety of sizes now a days. 26er, 29er, 650b, 700c etc are some of the common sizes now a days. The size of the bicycle tire that you could choose from depends on the circumference of the wheel (or rims) that you have on your bike. The easiest way to find the size of your bicycle tire is to look at the sidewall of the tire that came installed on your bike. It would appear in a format similar to this – 26×1.75, 29×2.25, 700x25c etc. The number before the ‘x’ will give you and indication of your tire size. Most of the wheels on modern bicycles are capable of taking a wide range of widths once you figure out the size of your tire based on the above information. On a tire, the width is specified on its sidewall where the size of the tire is mentioned. Eg. – If the tire has its dimensions as 26×2.25, the number after the ‘x’ specifies the width of the tire. Road bike tires generally come in 23c or 25c dimensions, commute and touring tires range from 28c to 38c and mountain bike rims can generally take widths ranging from 1.5 to 2.5 inch widths. The smaller the width of the tire, the lesser the rolling resistance. Tires with wider widths provide more grip and a more comfortable ride since they are more forgiving to being ridden at lower pressures, hence making the ride more cushy. Flat protection becomes a crucial factor in certain cases and can play an important role in picking the right tire for your bike. For people who frequently hit the trails, having a tire with good flat protection can make the difference in between having a fun filled ride or a ride spent fixing flats for most of the time. Generally, basic tires come with very minimal protection from road and trail debris (glass, thorns, sharp stones, nails). However, as we move up in the price range, flat protection is one thing that keeps improving throughout. Tire manufacturers these days use composite rubber compounds to give added strength to their tires. Some manufacturers also use compounds like Kevlar to reinforce their tires and make them more resistant to road debris. Now a days, there are many tubless and tubless ready options available in the market for trail riders who frequent routes that have a lot of harsh terrain and riding conditions. Also, using a tire liner is an inexpensive way to provide added puncture protection to your tires. But do make sure you choose the correct tire liner based on your tire dimensions. The weight of a tire becomes a crucial factor when one is competing and racing at some level since lower weights mean that its easier for the rider to change momentum and accelerate, not so otherwise. Factors like durability, flat protection etc play a more important role if you happen to be a recreational rider. Why are some tires more expensive compared to others? A lot of times we are left wondering why there is such a wide range of pricing associated with tires! Well, a lot of it has to do with the above mentioned parameters. As the price of the tire goes higher, one does get superior flat protection, lower rolling resistance and in many cases, an added weight advantage. Some tires also come as foldable tires.This makes the tire easier to transport compared to the non-folding tires. A good quality tire goes a long way in making the riding experience more enjoyable, comfortable and hassle free. So it is very important to choose the right kind of tire based on ones needs and not focus too much on the cost aspect associated with it. Hope that armed with all this information, you are going to find it easier and hassle free to pick the tire that suits your need the best. Check out our complete range of quality and durable Schwalbe tires here.